Manchester City Council has been working with with THINKlab & Mirrorworld Technologies Ltd exploring how advanced data visualisation technologies could be used to improve the services to Troubled Families (TF) in the City. The City Council wished to understand the wider research expertise within the University of Salford that may also provide additional insight and intelligence into the Troubled Families domain. The City Council focused on how to better understand the connections between people and place and place and people across its City footprint. Scenario Planning Workshop engaging MCC staff with the ThinkLab/Mirrorworld team to determine TF user requirements, defining a range of scenarios to illustrate how the Platform may be used to represent the epidemiology of troubled families in the City, identifying key sample datasets etc. Joint MCC/Faculty Workshop – this captured a wider multi-disciplinary perspective drawing expertise from a number of the University’s faculties. Key questions explored included underlying drivers which led families to becoming troubled, how can a person affect a place and a place affect a person, and how can we improve our insight and understanding of troubled families. Feedback from the workshop directly contributed to shaping the data mining element of the prototype development and identified a number of research areas linked to TF priorities. Technical Development of the MCC Platform – comprising technical and interface design and associated software engineering to create the prototype platform. All design aspects were informed by the above workshops and utilised sample data from the City Councils iBase system and other social data sources. 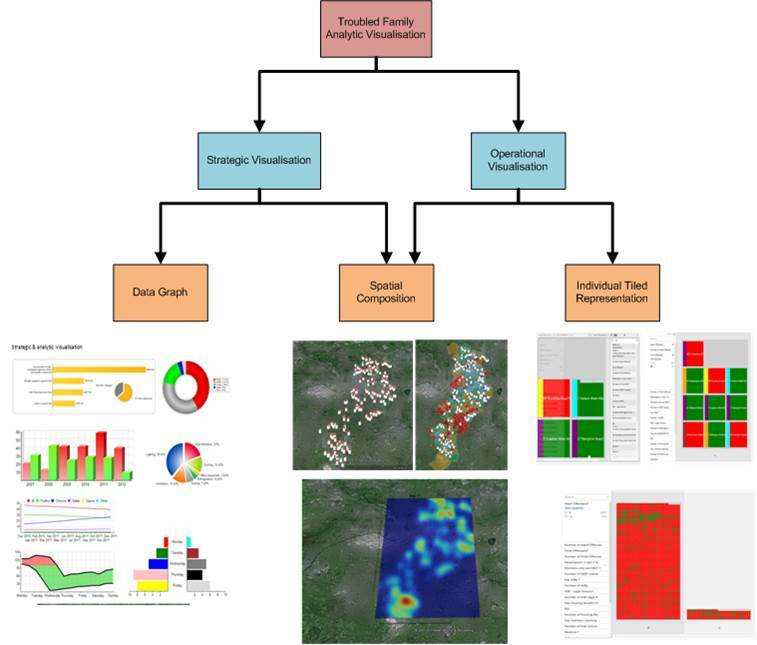 An interactive platform capable of generate new scenarios from selected datasets to show spatial connections & distribution patterns of TF behaviour in comparison with other key characteristics e.g. incidence and distribution of offending behaviour within TF, showing linkages between incidents of crime & the families who may be involved with each crime incident. In parallel with the above developments MCC and University of Salford opened up discussions on how best to enable arrangements to support a longer term partnership relationship to align the research capability of University faculties to MCC strategic priorities, opening up new research and collaboration opportunities for both organisations. Feedback from MCC & their public sector partners including the Manchester Investment Board (MIB) to the TF prototype was very positive & highlighted other policy domains where the technology could potentially add value, including housing, community safety & social cohesion. The wider strategic partnership between Manchester CC & the University of Salford which was established during the prototyping phase has continued to develop. If your interested in learning more about how advanced data visualisation technolgies can assist your business please contact us so we can discuss your challenges.